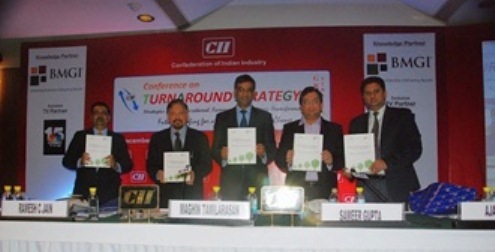 Confederation of Indian Industry (CII) along with Breakthrough Management Group (India) as Knowledge Partner organized the “Conference on Turnaround Strategy”. 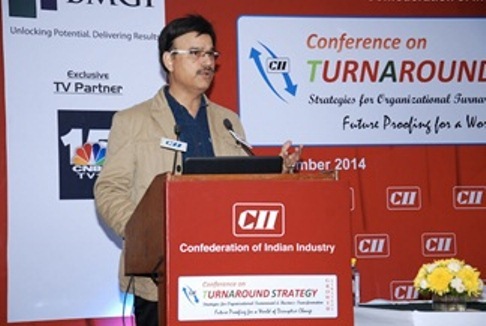 The conference focused on providing a roadmap to Industry on formulating strategies for Business Transformation. 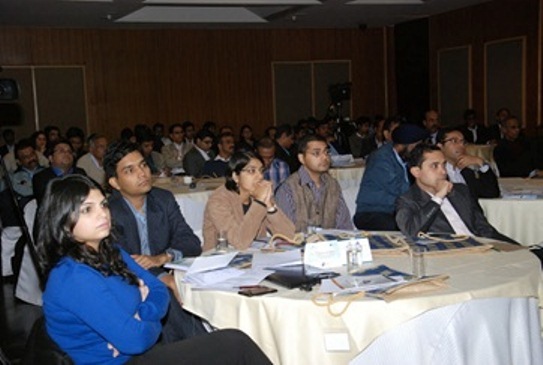 The conference was attended by over 100 organizational representatives. BMGI and CII released a White Paper on “Strategies for the New Age Corporation – Bridging the Chasm Between Fact and Fiction.” The white paper clearly outlined aspects of a robust strategy planning and execution process . The note emphasised being able to manage the paradox of negotiating the unknown future successfully with structured innovative thinking, scenario planning and ‘conscious & monitored assumptions’ as enablers to pure data and knowledge based approach. Mr Naresh T Raisinghani. CEO and Executive Director of Breakthrough Management Group International (India Division) introduced the overall theme of the conference and introduced the opening session. He outlined four key steps to a successful business strategy: 1 - create the correct vision; decide what not to do; 2 – Ensure that technology/digitization are critical aspects of the strategy and not just enablers; 3 - socialize strategy with all your employees. Naresh recommended the use of the Balanced Scorecard or Hoshin Kanri as means to deploy strategy and ensure connect with employees; 4 – realize strategy by ensuring appropriate review and tracking as 80 % of the success of strategy was in the execution. He also stressed on the need to have the “right strategic metrics and initiatives” to ensure focus. Mr Maghin Tamilarasan, Director Strategy & Business Development of Rolls Royce India Ltd enumerated his companies “three pronged” strategy – Focus on Customers, Innovate and Ensure Profitable Growth. He made an interesting point on the need to “Invent Once and Use Many Times”. Mr Ramesh C Jain, Past Chairman CII Haryana State Council, Former Group Vice Chairman Eicher Group, spoke about the need for a Strong Leadership for ensuring Business Turnaround. He shared his experiences on the successful turnaround of Ramon & Demm Ltd. He delighted the audiences through the narration of how the team at Royal Enfield Motors “reinvented” the Bullet motorcycle. He let out the secret to the companies success – build the business around the customer. Ramesh narrated several examples on how “customer centric approach” led to many successes for Royal Enfield. Dr Shubhrangshu Roy, Business Head at BMGI (India Division) chaired the second session on “Staying Ahead and Maintaining Leadership Position”. He gave a perspective on the need to build a bridge between product innovation and the demanding customer. The first speaker in this session, Mr Rahul Chaddha, CEO - RWL Healthworld Limited described the strategies of his company to gain market leadership. He indicated that the availability of the right product at the right place and the right time is of prime importance. He concurred with Naresh’s perspective that to enable this strategy; Technology is the key. Mr Ramesh Agarwal, Chairman of Agarwal Packers Group continued the discussion and highlighted the need for Innovation to be the core driver of strategy for ensuring success in the rapidly changing business environment. He passionately shared some of the innovations done by them to improve customer satisfaction. He quoted “it is impossible to satisfy the needs of every member of the family in the business of shifting” but keeping a highly customer centric approach their organization has managed to achieve this goal. The innovation led strategies have enabled his company to reduce costs, improve customer satisfaction and contribute towards the environment. The company enjoys continued leadership position – Number 1 to 50 as stated by Ramesh!! Mr Tarun Jain, Head Strategy & Business Development from New Holland India talked about models for diversification and identifying opportunities. He gave provided the strategic blueprint for how his company had diversified beyond the traditional business like making tractors and moved towards “selling farm equipment and financing of tractors”. Mr Ambarish Raj, Business Head at BMGI – India Division, chaired the next session. He stated that going global might not always guarantee revenue growth. Any such expansion can only be successful if backed by appropriate understanding of which market to target. Ambarish explained the possible growth strategies and techniques for identification of “underserved opportunities”. He stressed that focusing on underserved opportunities can fuel unprecedented growth. Mr Pankaj Dubey, Country Head and Managing Director Polaris India Private Limited concurred with Ambarish and highlighted his company had thrived by identifying “underserved opportunities” – i.e. the leisure/ off-road biking segment. Mr K K Verma Author and Founder Director Innovative Institute of Learning stated that it becomes imperative for organizations to unlearn the past if they wish to thrive in today’s context. He provided a roadmap on how to unlearn and then relearn. Breakthrough Management Group International (BMGI), is a global consulting firm with a strong focus on delivering results and partners with organizations in various stages of their business life cycle to transform their business performance. BMGI enables businesses to Innovate, Strategize and Solve Complex Business Problems. Headquartered in the US, BMGI has delivered cumulative benefits to its clients worth several billion dollars with an ROI of 5:1 to 20:1. In India, BMGI is located in Mumbai. BMGI’s clients include leading Fortune 1000 Global companies and other Indian companies from diverse industries such as financial services, IT/ITES, airlines, chemicals, FMCG, discrete manufacturing, telecommunications, petrochemical, textiles, healthcare & energy. Some of BMGI’s global clients include Hitachi, Siemens, Philips, Unilever, DeBeers, Avis Budget Group, TNT Express, General Dynamics to name a few. BMGI’s Indian clients include amongst others Asian Paints, Cognizant, Daimler Benz, Franklin Templeton, HDFC Bank, HUL, ITC, John Deere, Kraft Foods, Piramal Healthcare, Reliance Industries, Sudarshan Chemicals, Vodafone and Volkswagen.